You may have seen by now that Paul Ince has made a truly baffling claim about Ole Gunnar Solskjaer’s start as Manchester United manager. The Norwegian tactician has proven a superb appointment as interim boss until the end of the season, though talk is already growing about him possibly getting the job permanently. 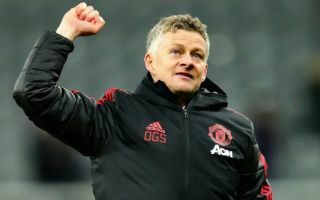 United were a mess under Jose Mourinho before his sacking last month, and Solskjaer has massively improved both the mood in the camp and the performances on the pitch since taking over. Despite that, former Red Devils star Ince believes people shouldn’t get too carried away by what the 45-year-old has achieved, saying he or any other former MUFC player could have done the same given what a dire state things were in under Mourinho at Old Trafford. ‘The shackles are off, but that doesn’t mean that Ole is the right man for the job. I could have gone in and done the same thing, so could Steve Bruce. This just smacks of bitterness from Ince, who perhaps feels aggrieved at not being considered for the job himself, as is so often the case from English managers with a lack of a real CV and a huge chip on their shoulder. It’s tough on Mourinho because he came in off the back of David Moyes and Van Gaal,’ Ince told Sky Sports in December. ‘Under Van Gaal they went back big time, they went back two years. While Man Utd were going back, Manchester City, Tottenham, Liverpool, they were going forwards. And then this in the Evening Standard a few days later: ‘There have been things going on for months now, the Paul Pogba situation, living in a hotel, not getting signings, which I believe have built up beyond repair. He’s had a lot of crap to deal with, but some of it he’s brought on himself. People are right to question the manager, but you must also look at the players, too. Are they really putting a shift in? Do they really care? And then this in an interview with talkSPORT back in November: ‘I feel for Mourinho at the moment because a lot of people are on his back. ‘So I can understand where Mourinho is coming from as far as shaking his head at (Marcus) Rashford – I can see that, it’s a manager thing. No signings, players forming cliques, not enough signings, bad work from the previous managers, everyone being on your back – thought this job was meant to be a piece of cake, Paul?